We are your language guides -- a family passionate about language learning and the joy (and sometimes angst) of cross-cultural interactions. YourLanguageGuide.com is a family project, through which we share ideas about language learning, exchange cultural insights, and offer encouragement. Write us a letter. If you like what you've read here on our website, you can book Terry or Leslie to speak at your professional gathering. We're not academics or professional linguists; we are a family who is passionate about language learning. We speak as fellow students who have tried to learn several foreign languages. We'll start by sharing some vivid cultural memories. 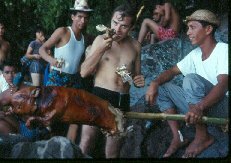 Terry at a Philippine pig roast. Terry Marshall: After an hour of rowing, our Filipino hosts spread out a magnificent picnic on an uninhabited island. My hosts asked what I would like to drink with my roasted pigs leg. (Yes, that's me in the photo.) Unfortunately, I didn't have a language guide. I quipped into the sultry afternoon, "An ice-cold Coke! " To me, it was just another goofy joke; even in the city, our friends always drank Cokes at room temperature, ice was too precious to waste chilling a drink. To my hosts, however, it was an order... To see how my sense of humor got me in trouble and other tidbits about my background, click here. 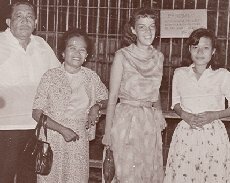 Ann chaperone's a school field trip in the Philippines. Ann Marshall: I was feeling hot and tired from a day shepherding students on a school excursion (there I am at the zoo, left). I was also slightly stuffed from too many heavy meals. Finally, our party of 8 sat down in a restaurant, but my stomach rebelled at the thought of another big meal. Mmmmm, a bowl of vanilla ice cream sounded soothing, cool, but not too filling. Danger! Danger! I should have had a language guide, because alas, in the lively chatter about the menu, I missed an important cultural cue... To find out what I learned from this episode and a few things about my background, click here. Leslie feeding kangaroos in Austriala. Leslie Woodford: When I was seven, my parents and I moved from the calm security of a small Colorado town to the jungled and mountainous Solomon Islands. Three years floated by. I hiked through the tropical forest to Tenaru Falls, rode outrigger canoes to visit indigenous villages, went four-wheeling through streams to stay at the Tambea resort, and snorkeled around sunken war ships in Iron Bottom Sound. 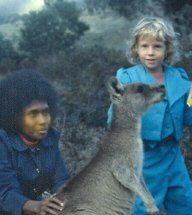 I even traveled to Australia, where I got to hold a koala and feed kangaroos (see the photo; Carolyn, a Peace Corps staff member and our friend from the Solomons, got to share the fun). I picked up the language within a few months and could chatter as fluently in Pijin as I could in the Queen's English. If you would like to read a little bit about my background, click here. 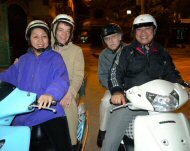 Terry and Ann on adventure in Vietnam. ...and lived to see another day, despite the fact that at least 6 million motorbikes are on the streets on any given day. I am not exaggerating. Population of the city is 10 million. These memories are timeless reminders of our personal growth in the process of learning new languages and coming to understand different cultures. Please take us along on your language learning journey. Let us be your language guides. Profit from our experiences. Share your insights with us. Let us cheer you on. And above all, enjoy the adventure. We'd love to share our free email newsletter with you. Sign up below to subscribe. Want to stay in touch? Subscribe to Language Lore, our internet language learning email newsletter. This free ezine facilitates your language learning journey. See our back issues here. Go to your email now to confirmation your subscription. If you don't see an email within an hour (check your junk mail folder too), please contact us. We respect your privacy and never sell or rent our subscriber lists. If you want to get off this list later, one click unsubscribes you.